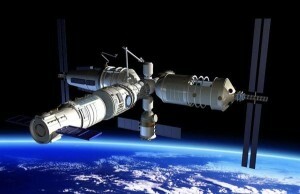 China’s 60-ton medium-size space station is depicted in this artwork. China is supporting a national day of space – a date selected that salutes the country’s first satellite launching back in 1970. April 24th will also note China’s ongoing aerospace activities as it marks the 60th anniversary of progress in that arena. 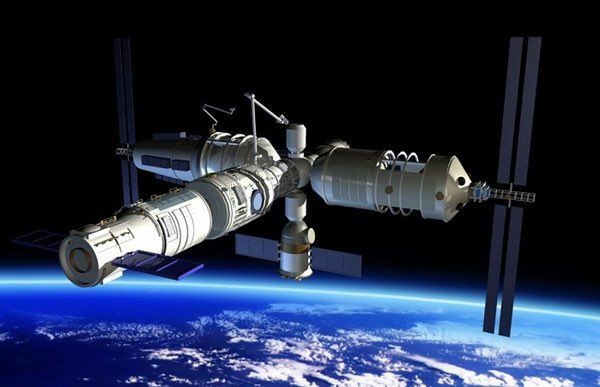 Meanwhile, China’s state-run Xinhua news agency has reported that the core module of its space station – due for launch around 2018 — will be tagged “Tianhe-1” – a Chinese word for Milky Way or Galaxy. That core module is to be orbited by the yet-to-fly Long March 5 booster headed for its maiden shakeout flight this September. Artist’s concept of the Tiangong-1 in Earth orbit. A Tiangong-2 is being readied for liftoff this September. 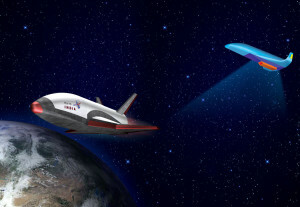 Coming up this year is launch of the piloted Shenzhou 11 and Tiangong 2 space lab. This second space lab is to rocket into space in September. 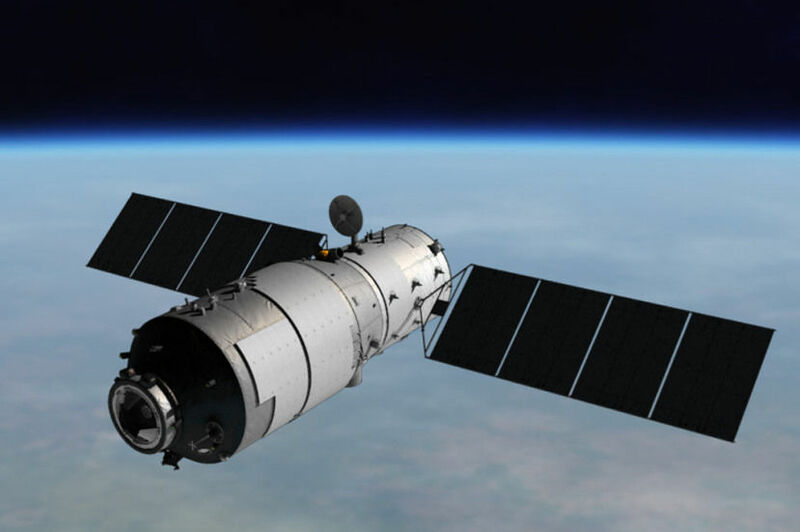 A month later, Shenzhou 11 is slated to carry two astronauts that will dock with Tiangong 2. In 2017, the maiden flight of China’s cargo ship, Tianzhou 1, is to dock with Tiangong 2. This supply ship is to be boosted by the Long March 7, a launcher also set to debut this year. 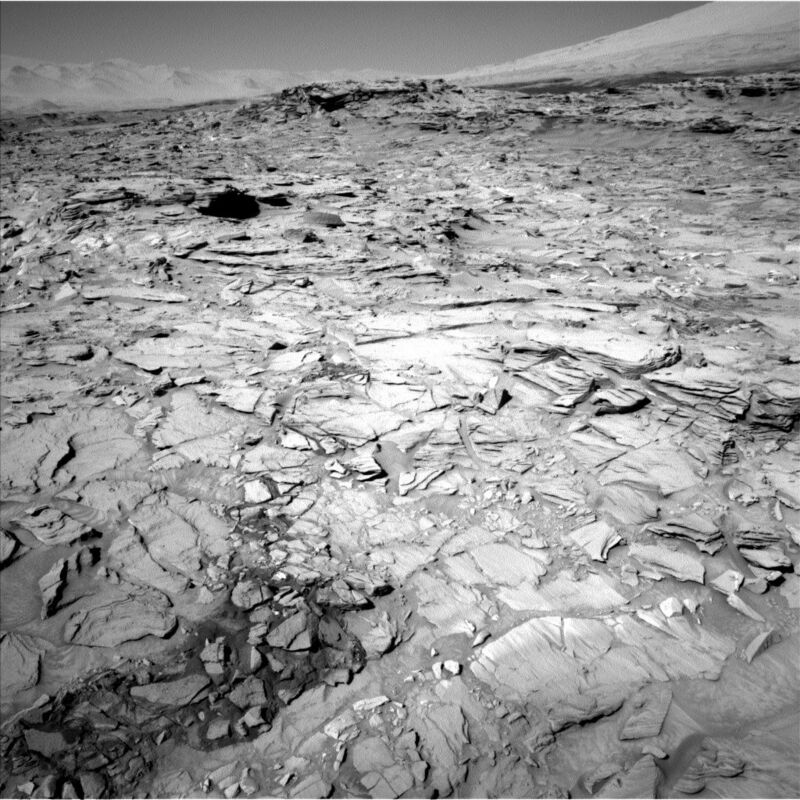 Curiosity Navcam Left B image taken on Sol 1316, April 19, 2016. 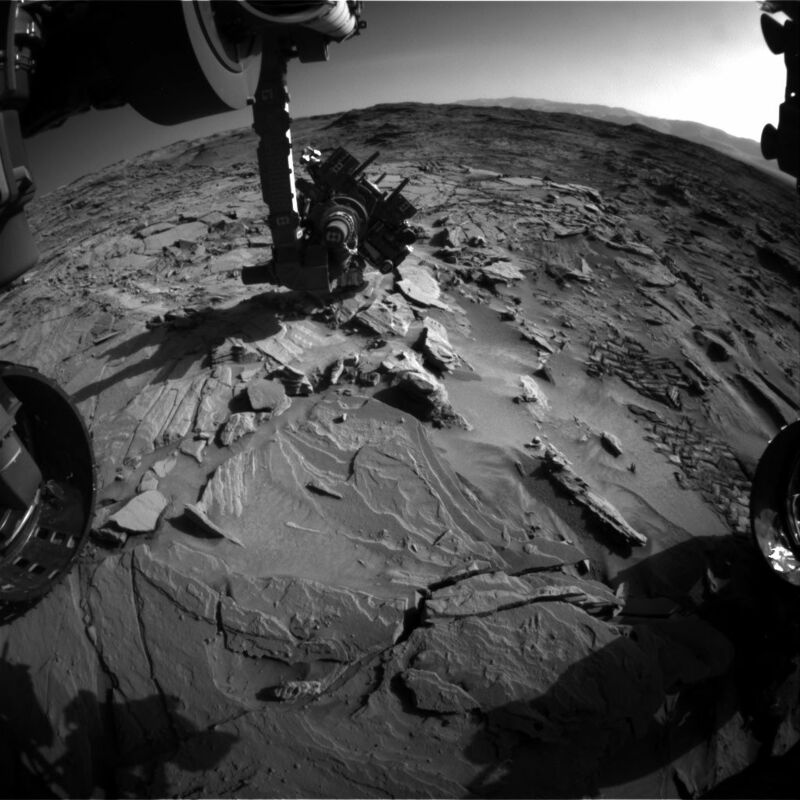 NASA’s Curiosity Mars rover is now in Sol 1317, with all activities planned for last weekend done successfully. 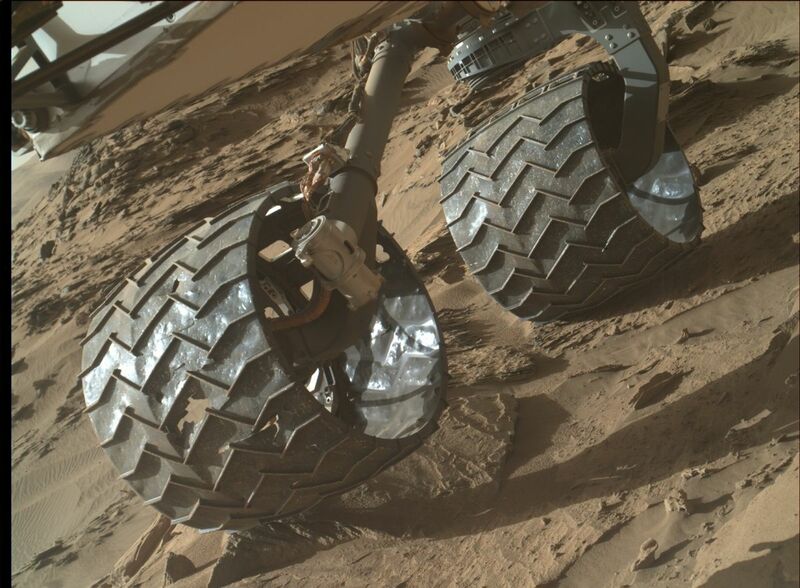 Ken Herkenhoff of the USGS Astrogeology Science Center in Flagstaff, Arizona also reports that the robot has completed a full wheel imaging session using its Mars Hand Lens Imager (MAHLI). The science team decided to return to the “Lubango” outcrop based on Chemistry and Camera (ChemCam) results that show unusually high silica there. Curiosity Mastcam Right image taken on Sol 1314, April 17, 2016. 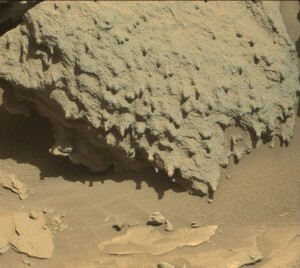 Curiosity’s Mastcam was scheduled to take images of the Lubango area, and Navcam will search for dust devils. Active Dynamic Albedo of Neutrons (DAN) measurements are planned both before and after a short drive of Curiosity, and the Chemistry & Mineralogy X-Ray Diffraction/X-Ray Fluorescence Instrument (CheMin) is to perform calibration activities overnight. Meanwhile, a new map has been issued that shows the route driven by the Mars rover through the 1316 Martian day, or sol, of the rover’s mission on Mars (April, 19, 2016). 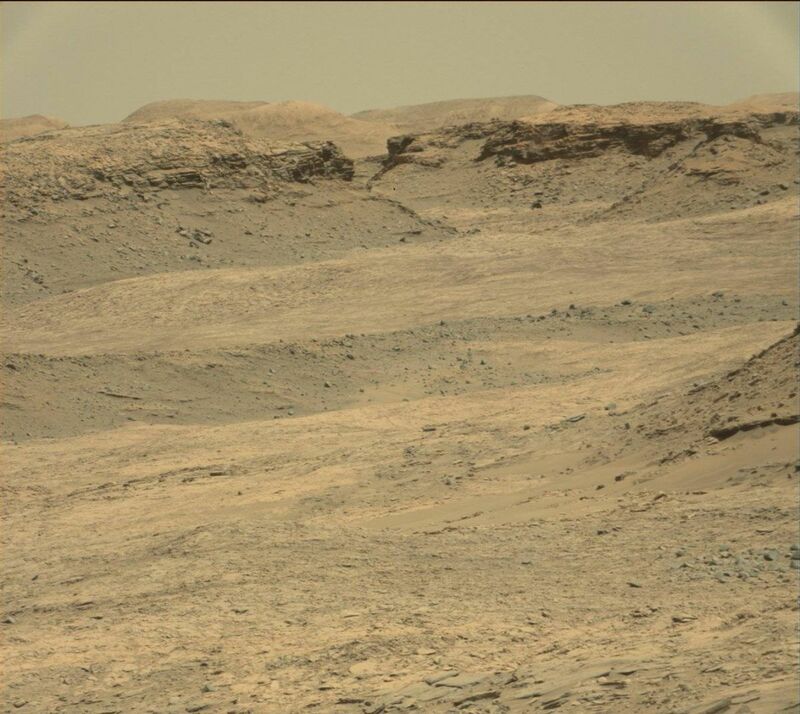 From Sol 1315 to Sol 1316, Curiosity had driven a straight line distance of about 50.66 feet (15.44 meters). 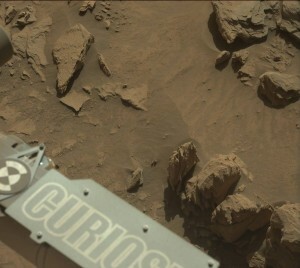 Since touching down in Bradbury Landing in August 2012, Curiosity has driven 7.91 miles (12.73 kilometers). Just in time for Earth Day on Friday, April 22, 2016! 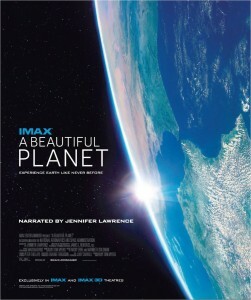 A Beautiful Planet Official Trailer #1 (2016) spotlights this HD documentary epic, an exploration of Earth and beyond as seen from outer space. The documentary features vignettes from Scott Kelly’s near-year exposure to space aboard the International Space Station. 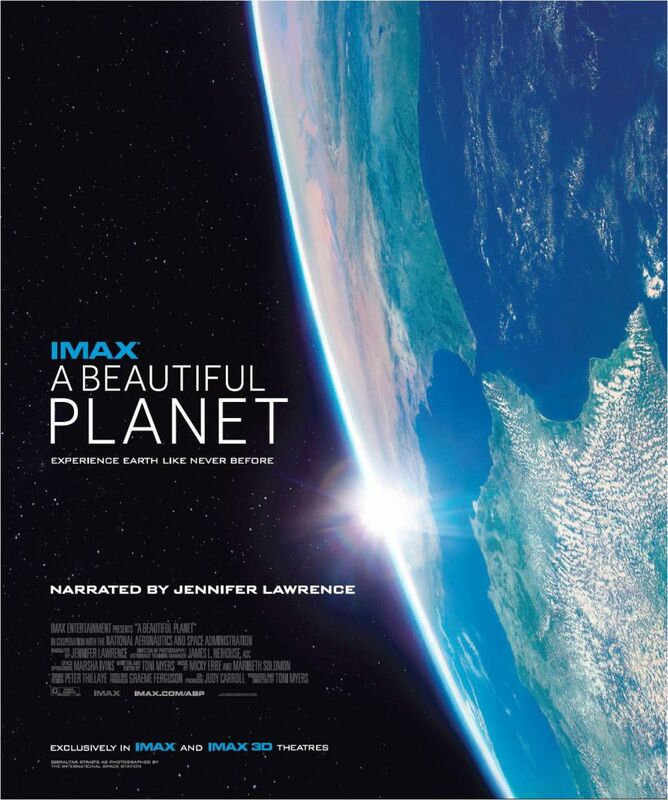 A Beautiful Planet was made in cooperation with NASA and features stunning footage of our blue planet…and the effects humanity has had on it over time. This visual treat is from IMAX Entertainment and Toni Myers — the acclaimed filmmaker behind celebrated IMAX® documentaries Blue Planet, Hubble 3D, and Space Station 3D. The documentary film hits the screen in select theaters on April 29th, exclusively in IMAX and IMAX 3D. Also, check out classroom activities inspired by the film to enhance your understanding of the Earth, the importance of the International Space Station (ISS) and the work that’s being done to conserve our planet and its resources. It is tagged as “Breakthrough Starshot” – using an ultra-light vessel made of what are essentially cell phone components and a thin, reflective light sail propelled by an enormous array of Earth-based lasers. 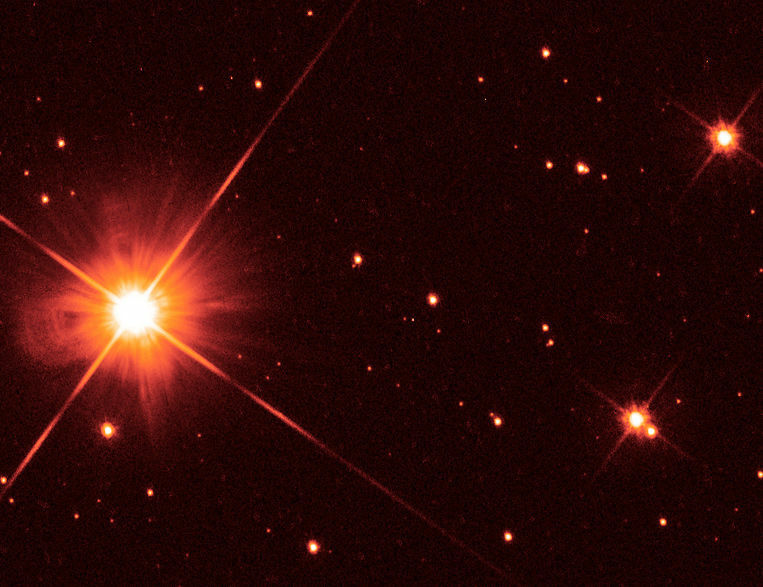 The target would be the nearest star — other than our Sun — Alpha Centauri. The plan was largely drafted by a team of Harvard astrophysics students and fellows led by Astronomy Department Chair Abraham Loeb. Loeb is the Frank B. Baird Jr. Professor of Science and director of the Institute for Theory and Computation at the Harvard-Smithsonian Center for Astrophysics. 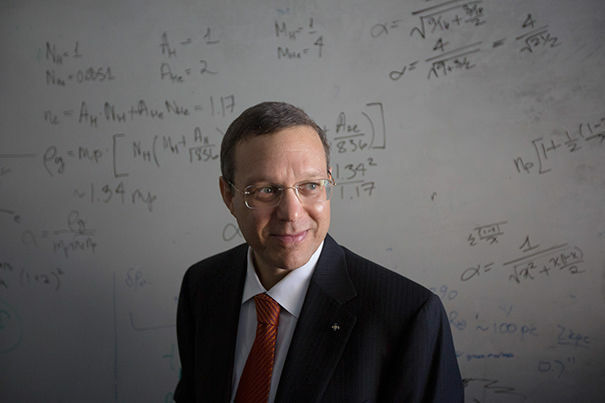 Loeb was approached last summer by Yuri Milner, a Russian Internet billionaire, and Peter Worden, the executive director of the effort and Chairman of the Breakthrough Prize Foundation. 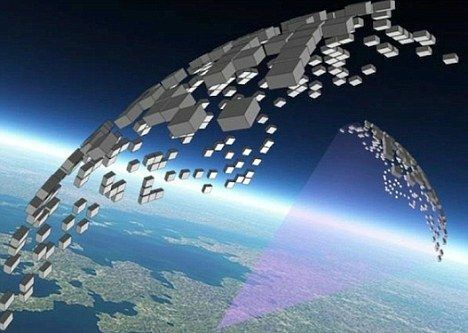 Milner has pledged $100 million in seed money for the project, which organizers expect will require billions of dollars, 20 years to launch, 20 years to reach Alpha Centauri (a binary system where two stars orbit each other), and four years for the beamed signal to reach Earth. Alvin Powell, Harvard Staff Writer, spoke to Loeb about the project and the importance of visionary ideas to excite the imagination and inspire a new generation of scientists. GAZETTE: This seems like a giant leap. From a technological standpoint, is this harder or easier than sending a man to the moon was when President John Kennedy first announced it in 1961? LOEB: I think it’s harder. Back then we had the technology. It used chemical rockets. All we needed to do was to build a sufficiently massive rocket that could carry a person safely to the moon. So there were engineering challenges, but the technique of making it was already demonstrated. Kennedy said, “We are doing it because it’s hard, not because it’s easy,” and that vision of going beyond Earth inspired a generation. A lot of young people went to work on space-related things, and there were benefits to society from the technology that was developed. There was a political context of beating the Russians, of course, but if you think of it from a scientific perspective, this vision was really uplifting, people were inspired by it. Oscar Wilde said, “We are all in the gutter, but some of us are looking at the stars.” And the way I see it is having a vision for something bigger could inspire a generation to work toward it. GAZETTE: What are the biggest challenges, the things we have to develop? LOEB: This method we’re talking about was conceived as soon as the laser was invented. Back in the ’60s, Robert Forward suggested using lasers to push a sail to high speeds. 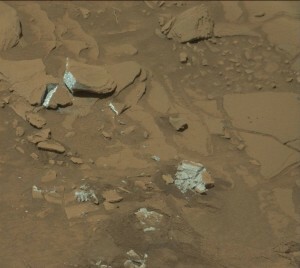 The pressure of the radiation — the light on the sail — is pushing it. You can get up to the speed of light in principle because you’re pushing it with light. The problem back then was that people thought that they needed to take humans along, and the weight of the spaceships would have been tens or hundreds of tons — very massive things, very difficult to construct. The big technological advance over the past decades has been the miniaturization of electronics, smart electronics. It was all driven by the cell phone industry. If you look at an iPhone and strip it from the case and the human interface, you’re left with smart electronics that weigh roughly a gram, much lighter than anything else to use. You can also build a sail that weighs roughly a gram, one that stretches a few meters in size. And in terms of lasers, there were big advances in putting together many small lasers and combining their beams into a single beam. There were these technological advances, but nobody put them in the context of space. 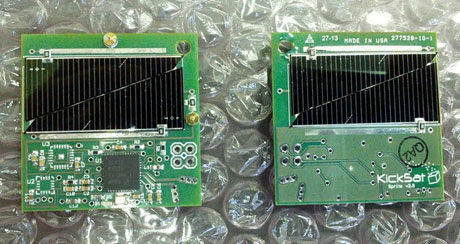 Within a couple of months, we will launch wafers — small chips that include smart electronics — into space for the first time. We have a team member, Zac Manchester, a postdoc at Harvard’s engineering school who is now working with me, who did his Ph.D. on this subject. We will launch a mother rocket and then release 100 of these into space just to see how they behave, how they survive at low temperatures. KickSat Project Manager Zac Manchester attempted to launch tiny “Sprite” satellites, but the small satellite reentered the atmosphere in May 2014 without deploying its cargo. The goal of the project is to get to the nearest star within the lifetime of our generation. The nearest star is four light years away, meaning that it takes four years for light to make it from the sun to that star, and that means a spacecraft needs to be launched at a fifth of the speed of light in order to get there within 20 years. GAZETTE: Is there a limit to how fast you can accelerate these little crafts? LOEB: In principle, if you put more power behind them, you could get them to higher speeds, or you could make them a lighter weight. But what we’re trying to achieve is already very challenging, so we’re trying to do the minimum necessary to achieve the goal. You need 100 gigawatts, roughly, for two minutes, in order to do that. There’s a certain distance out to which you can focus the laser light and still have the beam small enough that it focuses on the sail and doesn’t diverge. And over that distance we need to reach a fifth of the speed of light. That tells you how powerful the laser should be. Just for comparison, a space shuttle launch lasts 10 minutes, and it consumes a very similar amount of energy as what we need, but we give it to a gram-scale spacecraft instead of the very massive space shuttle. Proxima Centauri via Hubble Space Telescope. GAZETTE: What do we expect to see at Alpha Centauri when we get there? And it’s just a flyby, right? LOEB: Right. It’s a flyby because it’s very difficult to stop something moving at a fifth the speed of light. The biggest cost is the launch, the infrastructure. 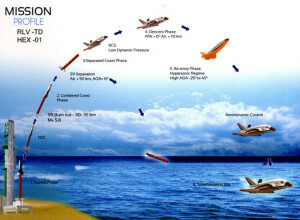 Once we have that, we can launch every day, we can have hundreds of them going there or in different directions. The first phase will actually be exploration of the solar system. Just to give you an example, to get to Pluto it would take three days instead of the 9½ years it took New Horizons to get there. If we launch at a fifth of the speed of light, it’ll get there the same week. 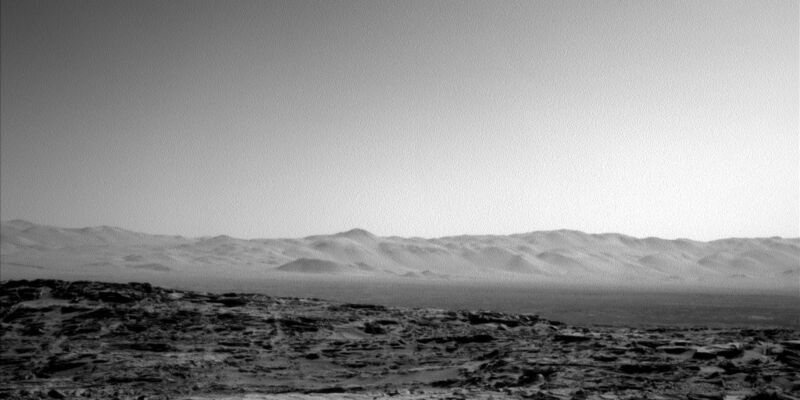 You can imagine FedEx sending packages to Mars, arriving the same day. This will allow exploration of the solar system first. For example, there is this moon of Saturn called Enceladus where you see plumes of water vapor coming out, and people think that under the icy surface there is liquid water and perhaps life. One way to find out is to go through the plumes and try to detect the fingerprints of life, these biomarkers. These spacecraft are so cheap — the ones we are launching in two months were about $20 apiece — you shouldn’t worry about sacrificing some of them that crash against the surface of an object. If they miss their goal or something bad happens to them, it’s not a big deal. You just send more. We will try to demonstrate this by launching a swarm of these guys around the moon first, taking pictures. There is a lot that one can do within the solar system. GAZETTE: Are there planets near Alpha Centauri? LOEB: We don’t know if there’s a planet in Alpha Centauri right now. But by the time we construct this system capable of launching something at a fifth of the speed of light, we will know for sure. Then we can target those planets. When I look through the window of my house at the back yard, it often looks the same. But if I walk out into the back yard, I find new things. I see a rabbit, a bird, and going to those distant places will allow us to find new things that we hadn’t expected. Columbus aimed for the East Indies by sailing westward, and he found the New World, something he didn’t expect. It’s part of any exploration. Once you go on the journey — even though you are motivated by one thing — you find many other things. GAZETTE: When Yuri Milner and Pete Worden came in to talk with you about the project, did you think “this is crazy,” or did you warm to the idea immediately? LOEB: I said, “Look, I need some time to look into the suggestions people made over the years and see if anything looks practical.” I asked my students and postdocs, “Who wants to be involved in this?” and most of them agreed. And since July 2015, we had weekly meetings, we basically went through all kinds of proposals that people have made. The only one that looked feasible is the one where you leave the fuel at home and you’re pushing the thing from behind with a laser or with a light beam. GAZETTE: How has the response been? LOEB: The response was overwhelming. I got hundreds of emails from people wanting to be part of this. But it’s not about the announcement; it’s about starting to work on these challenges. The real work starts now, as far as I’m concerned. We need to demonstrate credibility in the next few years — that we know what we are doing. We need to demonstrate the technology, that’s the important thing. Curiosity Front Hazcam Left B image taken on Sol 1313, April 16, 2016. NASA’s Curiosity rover is about to enter Sol 1314 on its Mars exploration adventure. The word from rover science planners is that Curiosity has moved into an area where there are no good brushable targets in the robotic arm workspace, so the dust removal tool will not be used. However, tactical planning included a trio of targets for the Mars Hand Lens Imager (MAHLI) and use of the Alpha Particle X-Ray Spectrometer (APXS) to make measurements of natural surfaces. Ken Herkenhoff of the USGS Astrogeology Science Center in Flagstaff, Arizona reports that the Sol 1313 plan was to start with a mid-day Chemistry & Camera (ChemCam) observation of the sky and Mastcam images of the Sun to measure the amount of dust in the atmosphere. The plan also called for Curiosity’s robotic arm would be deployed to take MAHLI images of “Kasane” and “Uau,” on either side of a bright/dark boundary in a selected outcrop. 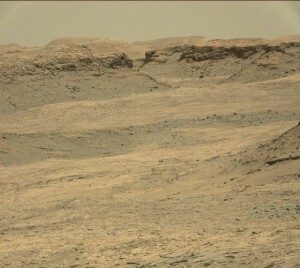 Curiosity’s Mastcam Right image taken on Sol 1312, April 15, 2016. 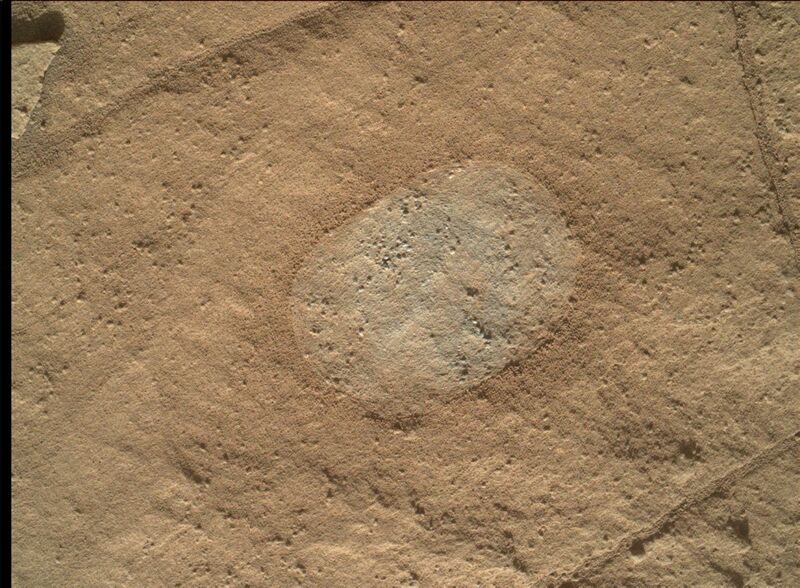 MAHLI was then to take pictures of another bedrock target dubbed “Onesi” and of the rover wheels. 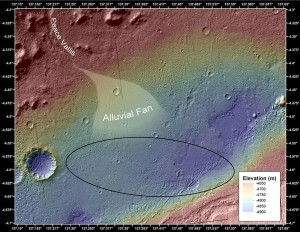 The rover’s APXS was slated to be placed on Onesi and then on Uau for detailed study. “Early the next morning, Navcam will search for clouds and Mastcam will measure dust again by imaging the Sun,” Herkenhoff explains. 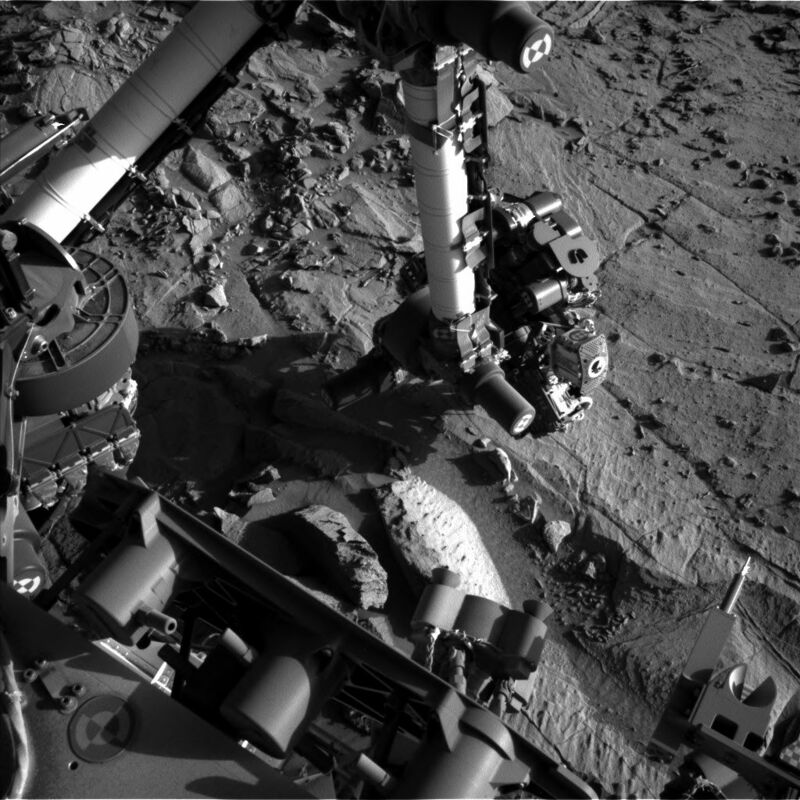 Later that morning, MAHLI will take pictures of the Rover Environmental Monitoring Station’s ultraviolet sensor, which is done periodically to see how much dust is on the sensor, he adds. 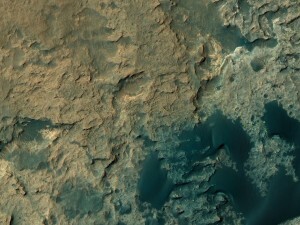 The Remote Micro-Imager (RMI) is slated to acquire a mosaic of Mount Sharp. Also, Mastcam will take stereo images of the “Rasthoff” area and image the Sun again, and Navcam will search for clouds. Finally, the APXS will be placed on Kasane for an overnight integration, in parallel with a Sample Analysis at Mars (SAM) Instrument Suite scrubber cleaning activity. Wheel damage assessment. NASA’s Mars rover Curiosity acquired this image using its Mars Hand Lens Imager (MAHLI), located on the turret at the end of the rover’s robotic arm, on April 16, 2016, Sol 1313. Lastly, on Sol 1315, the plan calls for the rover to complete a full set of MAHLI wheel images, bumping in between images to ensure that all parts of the wheels are imaged, Herkenhoff says. “The usual set of post-drive images will then be acquired to set us up for planning on Monday, when we will probably drive again,” Herkenhoff concludes. As always, planned rover activities are subject to change due to a variety of factors related to the Martian environment, communication relays and rover status. Curiosity Rover’s Location for Sol 1310. This map shows the route driven by NASA’s Mars rover Curiosity through the 1310 Martian day, or sol, of the rover’s mission on Mars (April, 13, 2016). Numbering of the dots along the line indicate the sol number of each drive. North is up. 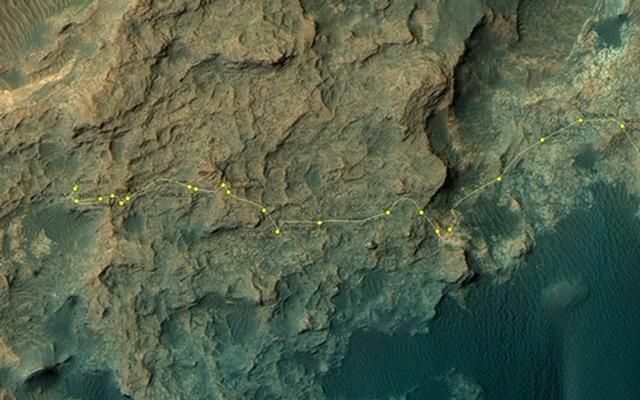 From Sol 1309 to Sol 1310, Curiosity had driven a straight line distance of about 67.09 feet (20.45 meters). Since touching down in Bradbury Landing in August 2012, Curiosity has driven 7.88 miles (12.68 kilometers). 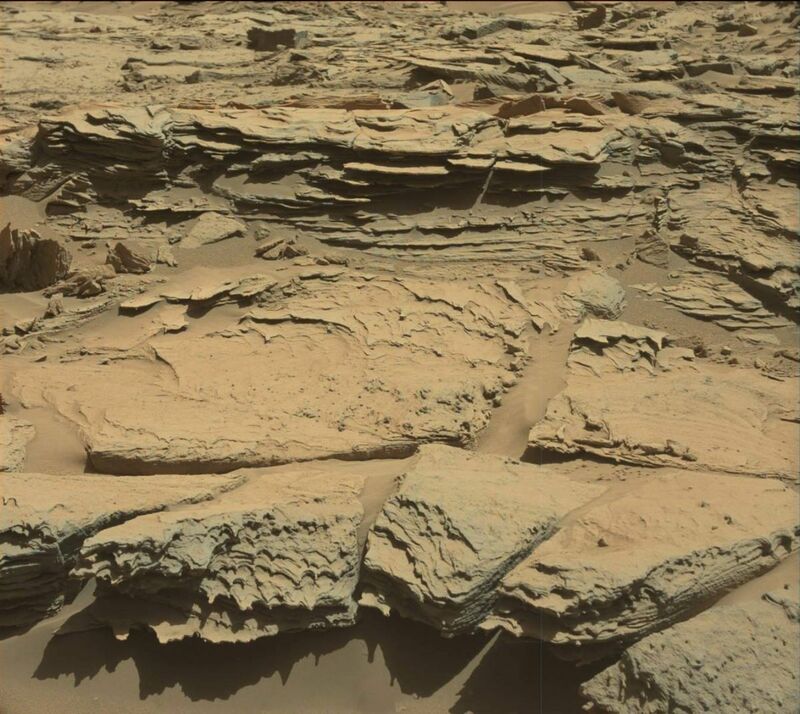 Curiosity Mastcam Left image taken on Sol 1305, April 8, 2016. 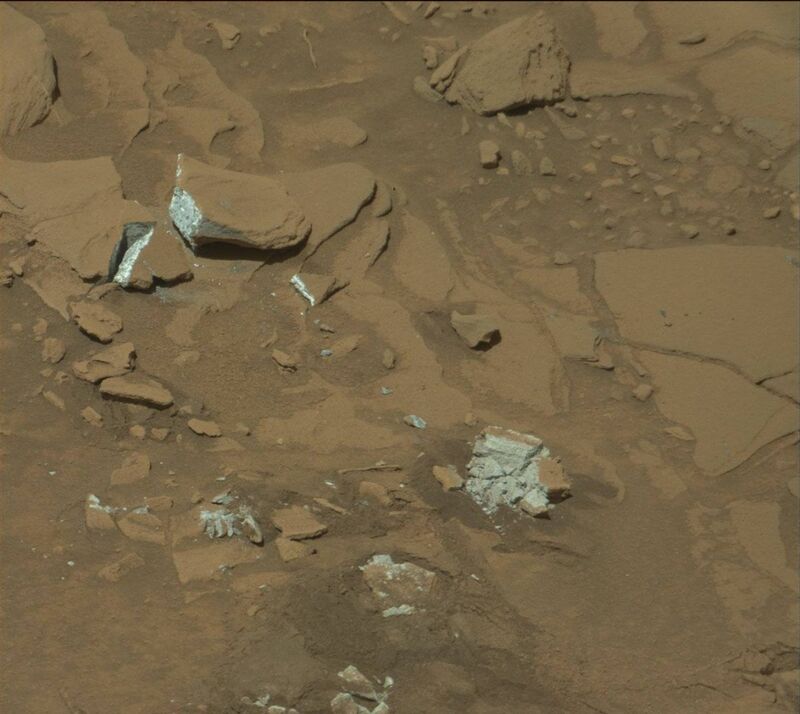 NASA’s Curiosity rover is just entering Sol 1307, recently experiencing some power and driving problems. The robot’s drive on Sol 1303 stopped during wheel steering, apparently due to a short in the rover’s nuclear power source. Meanwhile, the plan for Sol 1307 is to deploy the rover’s robotic arm to accomplish contact science of rocks in front of Curiosity. Curiosity Mastcam Right image taken on Sol 1305, April 7, 2016. Also on tap is use of the Mars Hand Lens Imager (MAHLI) to acquire a couple images of Divundu before dust removal brushes are used on the target. The Alpha Particle X-Ray Spectrometer (APXS) is to be placed on Gaio and then on Divundu for detailed study of the rocks. Herkenhoff adds that early on the morning of Sol 1308, the Right Mastcam will acquire a mosaic of the north side of Aeolis Mons (“Mt. Sharp”). 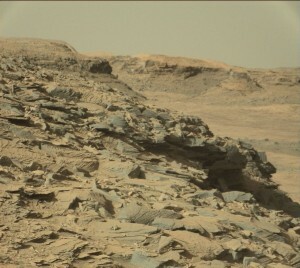 Curiosity Mastcam Left image taken on Sol 1305, April 7, 2016. Later that morning, Navcam will search for clouds and dust devils, and Mastcam will image the crater rim to determine how much dust is in the air within Gale crater. In the afternoon, the arm will be stowed before Mastcam acquires a multispectral observation of the Divundu brush spot before the rover attempts to drive again. After taking the usual post-drive images, the rover will go to sleep and recharge its batteries in preparation for Monday’s set of activities, Herkenhoff notes. The Indian Space Research Organization (ISRO) is pushing forward on reusable launch vehicle technology. 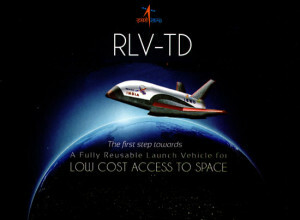 According to ISRO, the winged Reusable Launch Vehicle-Technology Demonstration Program (RLV-TD) is a series of technology demonstration missions for realizing a two stage to orbit (TSTO) fully re-usable vehicle. According to a March 29th news item in The Hindu, the premier flight of the program is slated for as early as mid-May. Riding atop a solid-propelled booster rocket, the craft will fly to over 40 miles (70 kilometers) altitude then released to plow through the atmosphere to a splashdown in the Bay of Bengal. K. Sivan, Director of the Vikram Sarabhai Space Center (VSSC), Thiruvananthapuram, led the RLV-TD development program and spearheaded its design, qualification, aerodynamic characterization and hardware development. 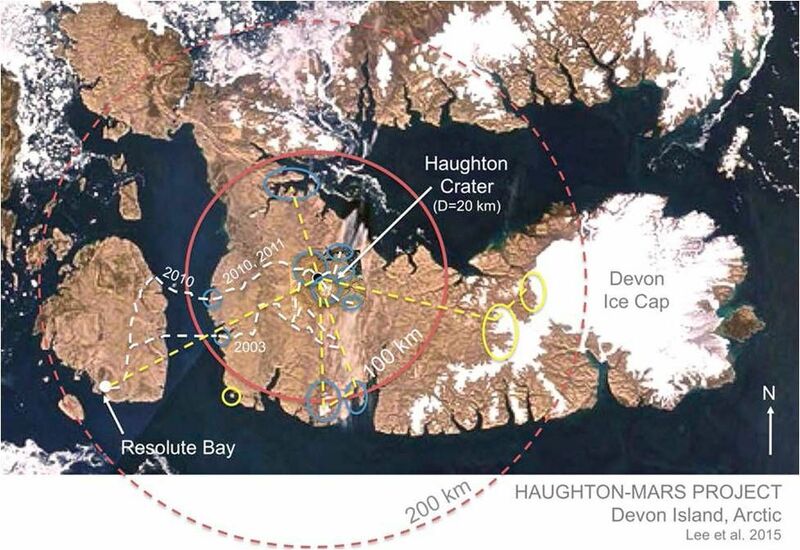 A new documentary film – Passage to Mars — details the Northwest Passage Drive Expedition, a NASA-supported, multi-stage 750-plus kilometer crewed vehicular traverse on land and on sea-ice along the fabled Northwest Passage in the Arctic. 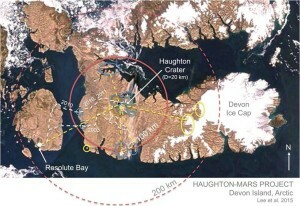 The primary goal of the expedition was to deliver the NASA Haughton-Mars Project’s (HMP) Okarian, a specially modified Humvee to be used on Devon Island as a Mars pressurized rover simulator. 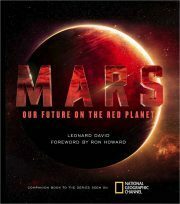 This impressive documentary film spotlights scientific objectives in astrobiology, geology, geophysics, planetary protection, climate change, and human Mars exploration studies. 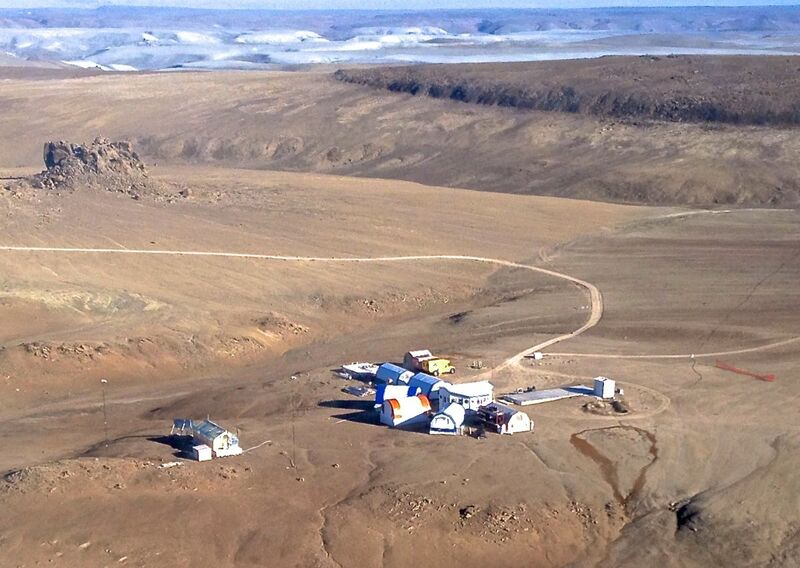 Devon Island offers training ground for future Mars expeditionary crews. “We wanted to have a record of our expedition on film, create a tool to help promote Humans to Mars, and inspire the next generation of explorers with a positive message,” explains expedition leader, Pascal Lee, planetary scientist at the Mars Institute and the SETI Institute, and director of the HMP at NASA Ames Research Center. The expedition includes Mars Institute team members Joe Amarualik, John Schutt, and Jesse Weaver. The documentary film crew included award-winning film director Jean-Christophe Jeauffre of Jules Verne Adventures and director of photography Mark Carroll. Passage to Mars is the saga of a crew of six aboard NASA experimental vehicle HMP Okarian, attempting to cross 2,000 miles of Arctic sea-ice to reach NASA outpost on the remote island of Devon – a place on Earth where humans prepare for Mars. 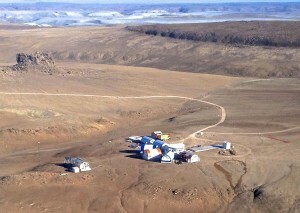 The Haughton-Mars Project (HMP) Research Station is home for field campaigns of international teams of scientists. This unprecedented adventure, planned to last a few weeks, becomes a two-year epic odyssey of hope, fear and survival. Shot on the breathtaking sea ice on Earth, and on Mars, as captured by robots, this true story is a vibrant, thought-provoking hymn to our thirst for discovery. “Gripping! Captures the truth of exploration! The will to survive against the odds,” says legendary film director, James Cameron. The film will premiere in Los Angeles, California at Laemmle Theaters the week of May 31 to June 5, 2016. 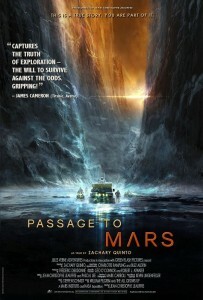 Passage to Mars opens May 31at Ahrya Fine Arts Theater in Beverly Hills, California. All screenings are to be followed with discussion by: Film director Jean-Christophe Jeauffre; NASA Expedition leader Pascal Lee; film crew; and special guests. NASA’s Curiosity Mars rover is now in Sol 1303 as of this posting. A new map has been released indicating the rover’s Location for Sol 1301. The map shows the route driven by Curiosity through the 1301 Martian day, or sol, of the rover’s mission on Mars (April, 04, 2016). Numbering of the dots along the line indicate the sol number of each drive. North is up. From Sol 1298 to Sol 1301, Curiosity had driven a straight line distance of about 14.69 feet (4.48 meters). 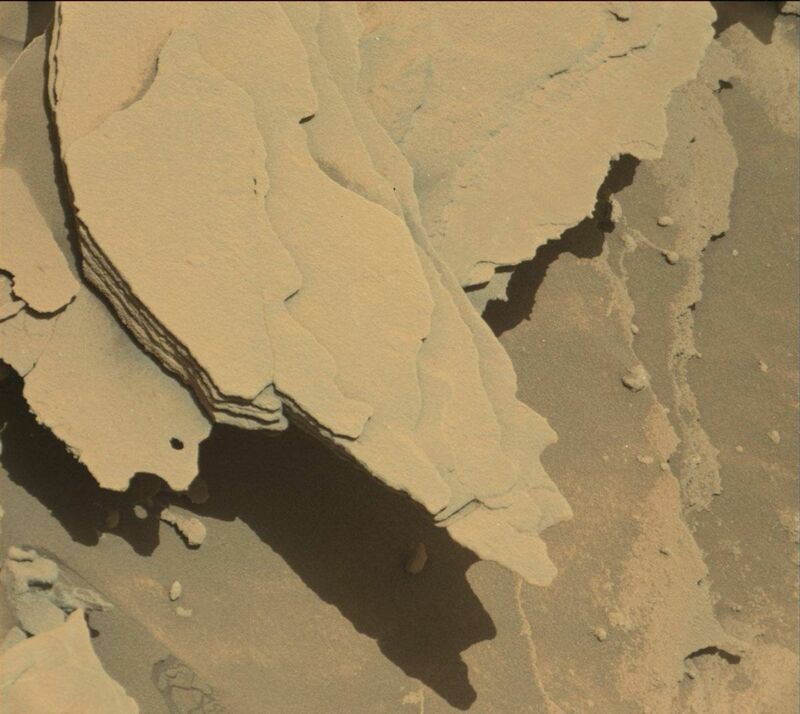 Curiosity Mastcam Right image taken on Sol 1301, April 3, 2016. Curiosity Mastcam Left image taken on Sol 1301, April 3, 2016. In other newly released imagery, the Mars machinery continues to take stunning and picturesque photos from its recent post-drive location. 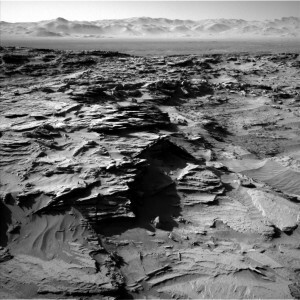 Curiosity Mars rover’s Navcam Left B image taken on Sol 1302, April 4, 2016. 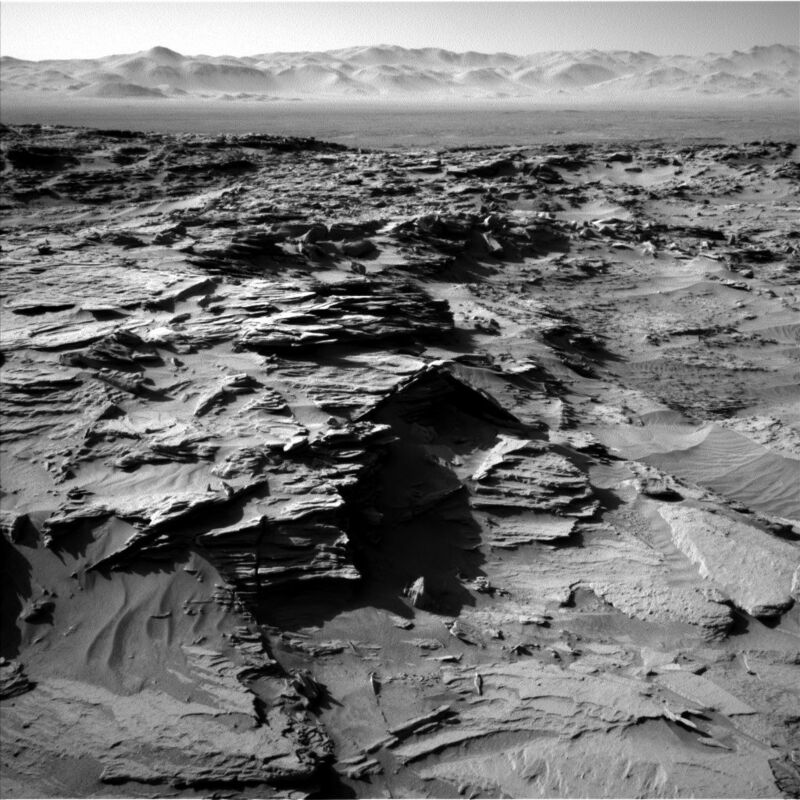 Curiosity Navcam Left B image taken on Sol 1300, April 3, 2016. 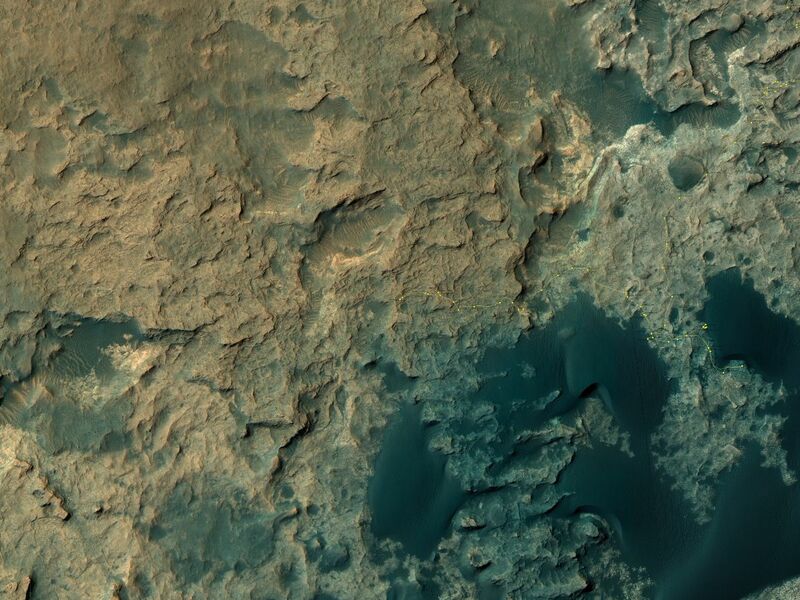 Now in Sol 1301, NASA’s Curiosity Mars rover has pulled up near the edge of the Naukluft plateau, driving across “Stimson” bedrock. 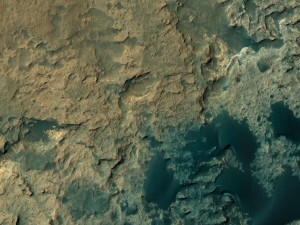 Reports Ryan Anderson, a planetary scientist at the USGS Astrogeology Science Center in Flagstaff, Arizona: The over the weekend plan called for a Sol 1300 trio of Chemistry and Camera (ChemCam) observations of the bedrock target “Bero” and fracture targets “Iona”, and “Arco” along with Mastcam documentation. 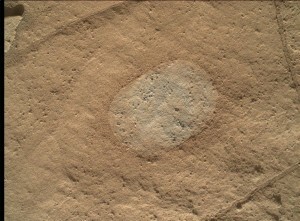 This was followed up by Mars Hand Lens Imager (MAHLI) and Mastcam images of Bero before and after brushing off the dust. MAHLI also has some images of “Gudaus” and measurements using the Alpha Particle X-Ray Spectrometer (APXS) are on tap to evaluate the composition of Gudaus and Bero. Brushing off dust of Bero, recorded by this Mars Hand Lens Imager (MAHLI) image taken on April 2, 2016, Sol 1300. In the early morning on Sol 1301, Mastcam was slated to take four mosaics of various portions of the Stimson unit. 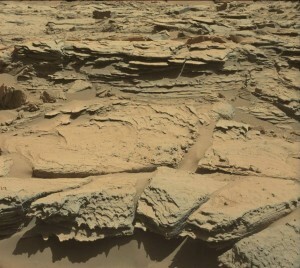 “These include areas with fractures and nodules, as well as some interesting layers in a nearby outcrop,” Anderson adds. 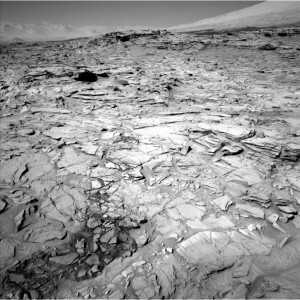 Curiosity Navcam Left B Sol image from Sol 1298, March 31, 2016. 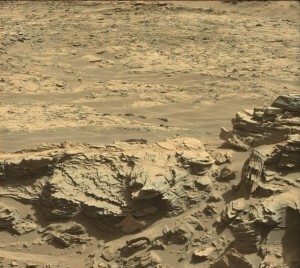 After that, the plan calls for a Curiosity drive about 165 feet (50 meters) and collect standard post-drive images. On Sol 1302, Anderson explains, Navcam and Mastcam are to acquire atmospheric observations, and ChemCam has a long-distance observation of Peace Vallis, the large valley carved into the northern rim of the crater. 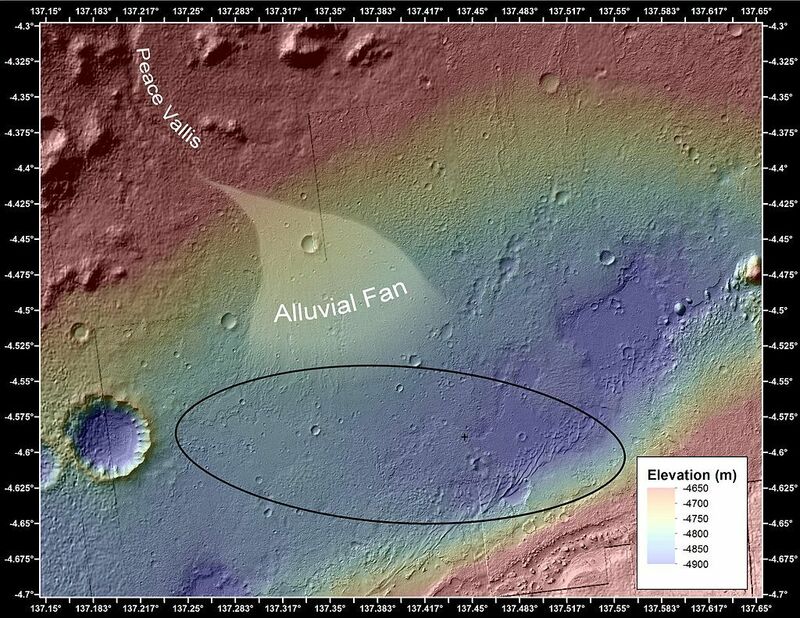 Peace Vallis is an outflow channel in Gale Crater. 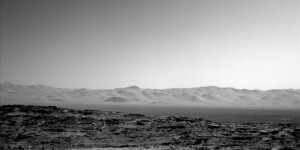 Mastcam is to then round out the day with a large 360 degree panorama from the rover’s end-of-drive location.